Over the sofa is a common place to hang artwork. 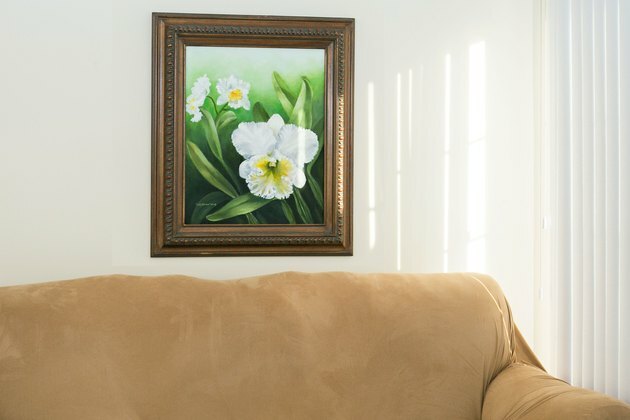 How to hang your art depends on the size of the picture, the room in which you want to hang it, the furniture and focal points in that room, and whether you are hanging a single picture or a group. 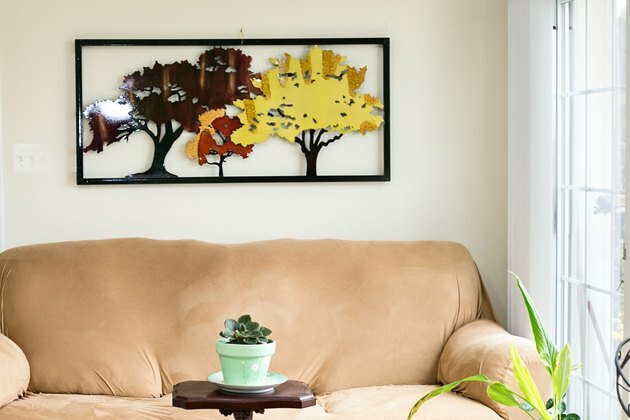 When it comes to hanging a picture above a sofa, the objective is to visually connect the two, which means hanging the picture fairly close to the top of the sofa's backrest. 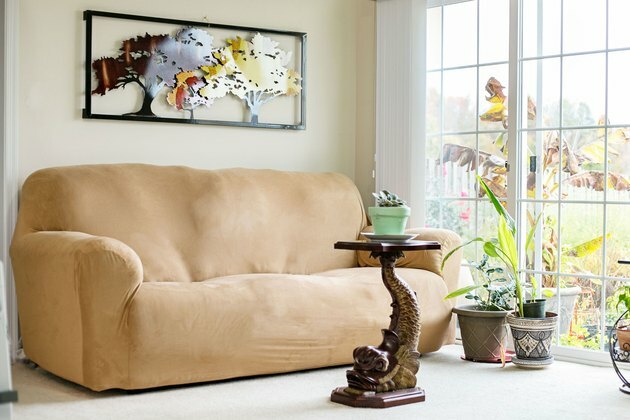 Hang the picture so that the bottom of the frame is 6 inches from the top of the sofa's backrest. Step back, and assess how it looks. Raise the picture if necessary, but don't raise it more than 12 inches above the top of the backrest. Hanging a group of pictures over a sofa is the way to go if you don't have an appropriately sized larger piece. Use the 6- to12-inch rule to locate the bottom row of pictures, and work up from there. 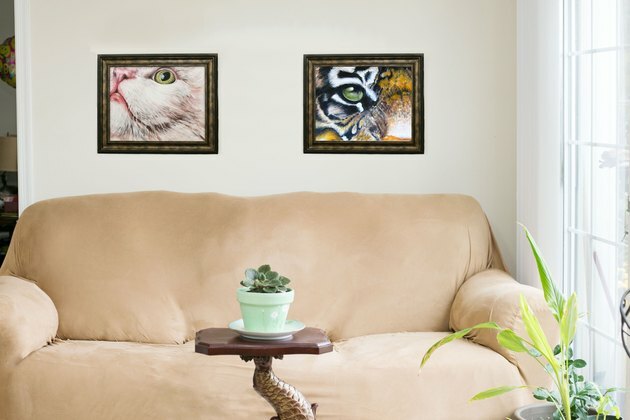 Hang enough pictures so that they take up an area that is at least half the width of your sofa. Aim for the total width of your larger picture or grouping to be anywhere from 50 percent to 75 percent as wide as your sofa. If your ceilings are high and you take your grouping close to the ceiling, you can keep the width a little narrower. The objective is that the sofa should not dwarf the picture and the picture should not dwarf the sofa. Use trial and error and your best judgment. 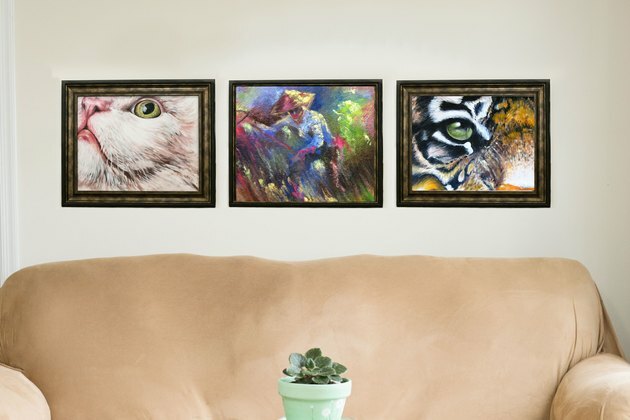 You probably have heard that you should hang artwork so that its horizontal center is at eye level, or about 54 to 57 inches from the ground. But this applies to hallways, art galleries and other locations where the artwork is not hung above furniture. Remember that the objective is to visually connect the sofa and the artwork. Imagine a sideboard with a wall hutch. You wouldn't hang the hutch 3 feet above the sideboard. Instead, you would bring the hutch down, closer to the sideboard, as if they were one piece of furniture. 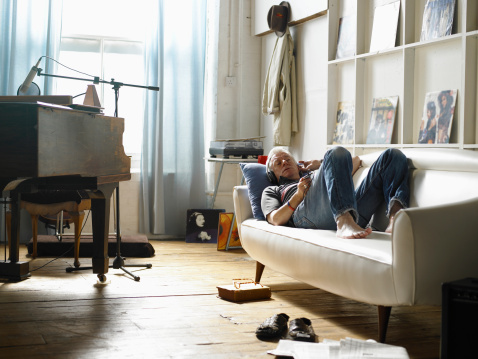 Follow this same principal when hanging art above your sofa.